This is the final installment in the three-part series on Networking at a Conference. So, you’ve researched, planned, and attended a Conference! You spent the time mingling at the event. You provided business cards to others and accepted cards from people as well. The event was amazing (check out my second blog post to relive my amazing time at Blogalicious 9!) and now, you are home soaking in the glow and energy of the experience. Now, what do you do after to keep the momentum going and achieve the original goals you’ve set before? Whether you are back home from a conference or local networking event, there are some things you simply must do as a means to make this event rock your business to the next level. Whether you have a pile of actual business cards or a list of names with contact information on various pieces of paper, now that you are back home you must organize that list of contacts. A networking event is a great place to earn new clients, create new prospects to market to and perhaps, hire new help for your business. Organize the data you collected from individuals at the event into categories. Ideally, you should follow up with all connections met at a networking event within 24 hours, but you can go up to 48, if you have a long list of people. While a good old fashioned phone call may be more personal, an email may do just fine for a follow-up. In the follow up you should be courteous, reference something that you two discussed at the event and make sure to show that you were listening to your conversation at the networking event. Now that you have organized your business cards and followed up. It’s time to find other ways to connect to keep in touch. You should create a list of individuals with whom you want to stay in contact with and try to reach out to connect on LinkedIn. This is a great networking platform for business minded people. Add any personal information to each contacts file such as birthdays, how you met, any information they provided to their business or interests. This helps remind me of who they are and maintain a higher level of connection with each person. Networking is all about helping each other out. At many networking events, people will be more than happy to spread the word about your business while in return you can help them out in some way. Perhaps, they have a sibling seeking a part-time job and you know someone who has an opening. These little tidbits are great ways to offer something to your new contacts. Try to offer some sort of assistance that doesn’t require a lot of effort and time to your new contacts as a means to break the ice. This helps to solidify your connection made. 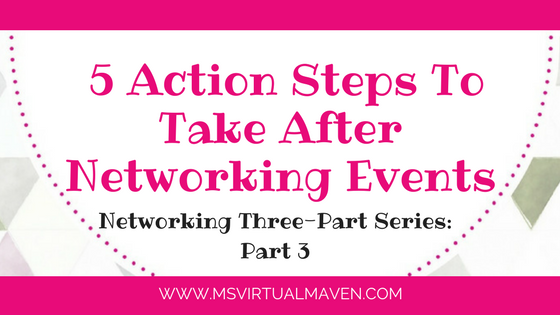 Follow up has never been easier when it comes to knowing what to do after a networking event. There are many resources to use such as LinkedIn, email lists, social media, and apps that remind you when to follow up with someone. 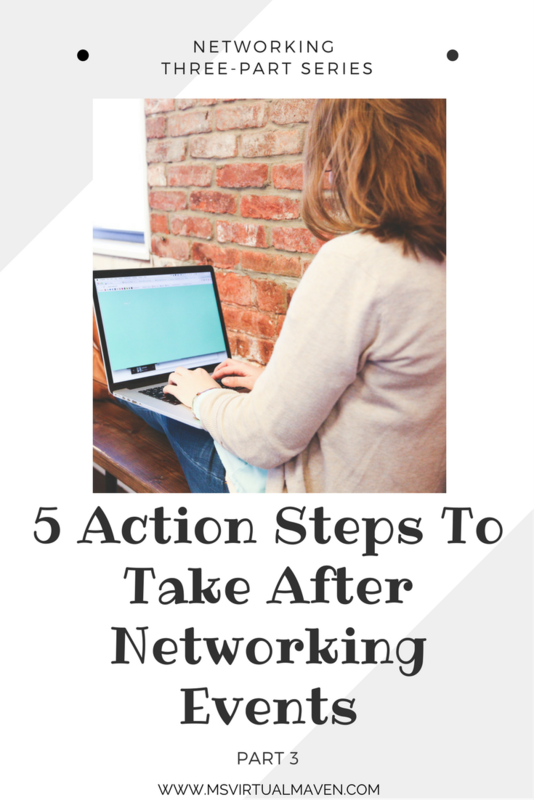 Learn to be proactive in your measures of making sure that networking event you just hosted or attended will actually lead you forward in successfully expanding your current business. I’d love to hear about your networking experiences, whether you attended a conference or local event! Did you meet your goals? Make a connection? Develop a whole new business out of your venture? Feel free to comment below or connect with me on social media – Facebook, Twitter, or Instagram! Want to know more about networking?